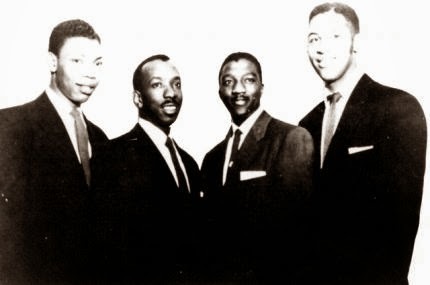 The superb vocalist Jim McGowan is at the center of any history concerning this group called the Four Toppers. Not only should the group not be confused with Motown’s later hitmakers the Four Tops, it is not the same as a group called the Four Toppers that was active in the '30s and ‘40s. McGowan began singing professionally in the mid-’40s in the company of several childhood friends, a period in which the activity of the first group called the Four Toppers was beginning to bottom out. Working in the style of gospel harmony known as jubilee, McGowan and associates performed at social events, storefront churches, and simply on street corners, at first dubbing their aggregation the Starlight Toppers. Use of the name the Four Toppers came about when a manager, Hattie Brisbane, pushed through a change from gospel to pop in the group’s repertoire. In this context the group made its debut at the Brooklyn Academy of Music in early 1952; within short shrift, several members were drafted and sent off to Korea.McGowan next used the name the Four Toppers in the following year with half the membership replaced. When he began suffering from serious health issues, the members of the group moved performing to the bottom of the pile. McGowan was back in action in 1954, first in various versions of the Schemers and finally in the Four Fellows. Here's where the wartime experiences of some of the members may have counted for more than bad memories; “Soldier Boy,” written by member David Jones while serving in Korea, became the group’s best-known hit.